December has arrived, and with it, all the joys of the festival season. This Christmas, JT is encouraging the community to make a difference to those less fortunate by giving essentials to local shelters and to Join Together. JT staff will be taking part in a reverse advent calendar. This is the concept of collecting essential items in a box every day in the lead up to Christmas. Then, delivering these to those who truly need them the most on Christmas Eve. 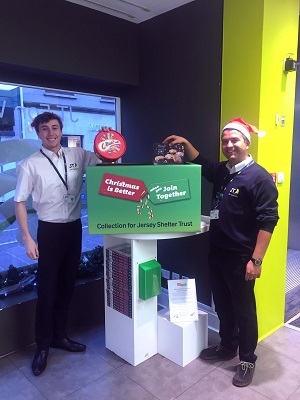 JT employees will be filling their boxes with items needed by The Shelter Trust in Jersey, St Julian’s House in Guernsey and, The Community Food Bank in Croydon. Tamara O’Brien, Deputy Managing Director of Guernsey, at JT said: The holiday season is a time when most people’s thoughts turn to being with those you love and sharing gifts. But for some, the season may bring feelings of despair rather than joy. The public are being asked to deliver any items they wish to donate to JT’s store on Queen Street in Jersey. Or to The High Street in Guernsey. Here a large box will be provided for donations. JT will arrange that the items are delivered to the shelters in time for Christmas Day. The Jersey Shelter Trust is the largest provider of services for homeless people in Jersey. They offer accommodation for up to 100 homeless people from four sites around St Helier and St Saviour. They also provide an Outreach service, for ‘rough sleepers’ in partnership with the Jersey Homeless Outreach Group. And, they support former residents who now live in their own homes, but need ongoing support.